My friend Erica was invited with a partner to the fourth edition of Expressions at the Taj Hotel, and as her husband was meant to be away she asked me to join her. Our party for two turned into a table for 6 as both our husbands joined us, as well as another couple. We started off by tasting a LOT of wine, and some of them were really fantastic. I was pleased to have another few tastings of the Fraai Uitzicht merlot as this is really a superior wine. After the tasting we went into the dining room to start our six course meal. Unfortunately, the evening dragged on a bit and we did not get home until after midnight. 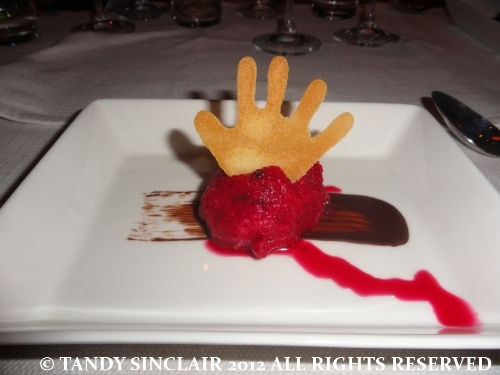 I am not sure where the slowness of the service started, but by the time the third course was served I had had enough wine to drink! Some people left after the mains due to the delay in courses coming out of the kitchen. 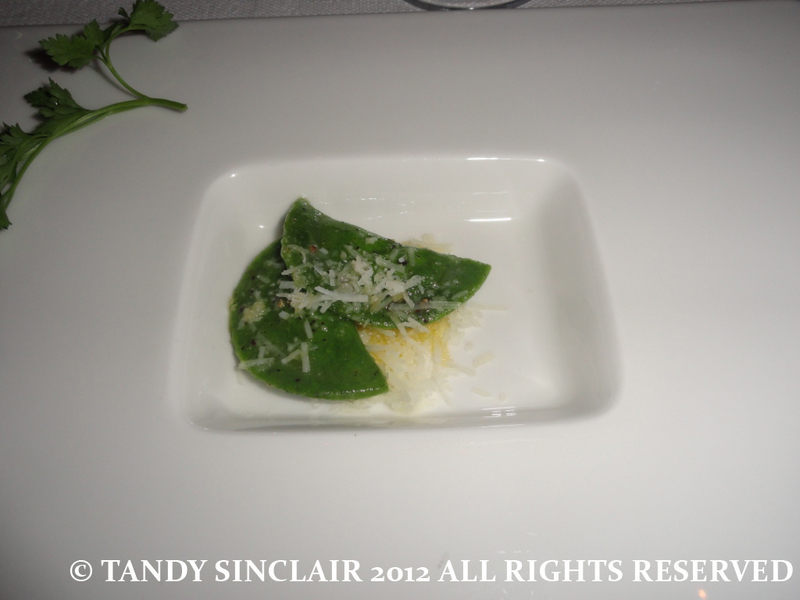 We started with a ravioli amuse which was paired with Esona’s Single Vineyard Chardonnay 2010. This was followed by a grilled steak tartare accompanied by Lamberg Estate Pinot Noir 2011. 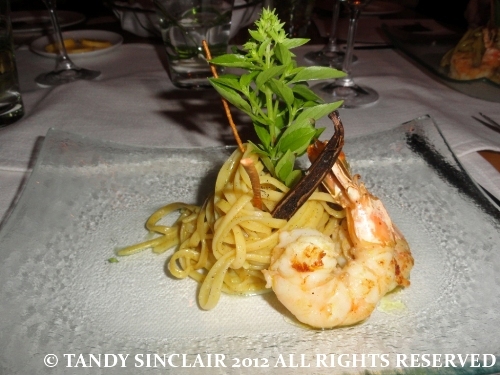 Our third course was a vanilla prawn pasta served with Arnedsig Wild Yeast Chardonnay 2011. 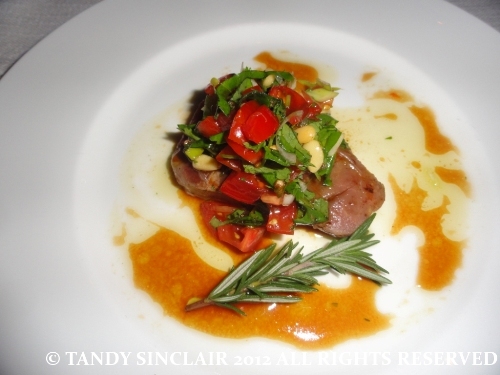 We then had a wrapped springbok served with a choice of Graham Beck Viognier 2009 or the aforementioned Fraai Uitzich Merlot 2006. 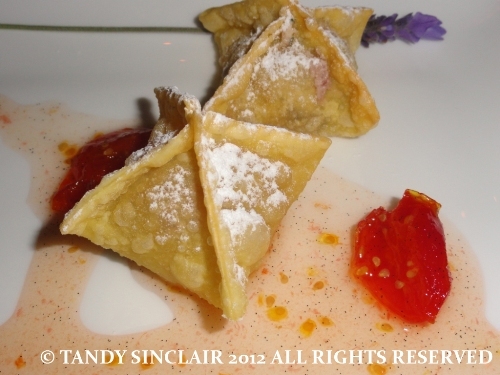 Dessert was a beetroot and Belgium sorbet followed by goats cheese wontons. The last course was not the best and ended our meal on quite a low when combined with the time delays. The cost of the dining experience was R325 and even though I was a guest, Dave paid for his own meal. The wine tasting is free so do pop in on any Thursday to have a try of the wines that are being showcased for the month. 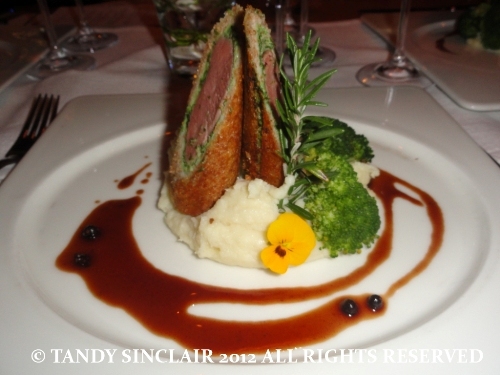 This month it is the Stellenbosch region and 96 Winery Road is the featured restaurant. I lov ethe look of the wrapped Springbok! Glad you were able to join us, it was a jolly group of six and I found the conversation as engaging as the food – which I thought was lovely, albeit rather late! 🙂 Lesson learned on this one I think in terms of the delays. Did you see Norman’s piece in the Bolander? looks divine. I’ve also been to functions when the food takes forever to arrive. Why do they do that, surely they must realise it takes the shine of the event/food. That looks very special food, Tandy. I find myself envying your visit! Such a feast!! I’ve done this sort of dinner before and it’s always my favorite and always so memorable with the pairings of wine for each dish! Lovely! Sounds like a long night. It’s a shame when so much is offered and the kitchen can’t get it right. At all events, you enjoyed a few good glasses.